Just read an interesting post on MMOchamp - It quotes an original developer on the vanilla team as having implemented ‘eating and drinking’ (to regain mana and health) in order to also allow people time to chat to other players. This never occurred to me but it makes sense - that downtime is not only providing a break from the action and a time to soak in the surroundings and music, but also to interact with guildmates and strangers alike. 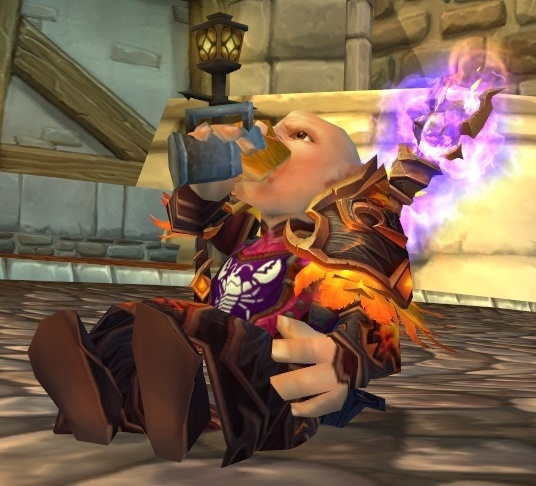 Think about it - the pace of legion is so intense that people never really take a break to like, talk to eachother, especially whilst dungeoning. It’s so cool to see that back then Blizz were really thinking carefully about how they would make their game ‘massively multiplayer online’, offering players the opportunity to socialise through mechanics like this. Amazing. Close to fifteen years with the game and it never occurred to me. Of course, when your druid types "mana break" usual thing which follows is - "so, where are you from?" I just hope Vanilla is going back to it's slow-pace aspect. Especially with this amazing background music the zones have. If the latest leak is anything to go by then there’s going to be no changes other than some high res textures so it’s looking good buddy! A fair point this - wow was my first MMO so I hadn't had any experience with the slower titles you mention! Whether or not this was an intentional side effect of eating and drinking - I have to admit that the times I did it were actually some of the most memorable in the game. I was one of those idiots who rolled a NE and went down the barrow too early - eating and drinking in between their pull ranges was freaky. This is also true of waiting for your crew to arrive at a BG or dungeon entrance, or reading quest text. Movie directors are masters of pacing, interspersing rapid action sequences with periods of calm. Something I think modern WoW really lacks with its constant pushing of dailies, artefacts, reputation and more to keep you buzzing around 100% of the time. I never actually thought about it that way. Also, I do not think that all that many players at all perceived it as such. back then the chat box was never empty while resting. That was a great move by Blizz. Never thought about it this way. Or the in game postal service. I have actually seen it in a couple of interviews with the original WoW developers (John Staats springs to mind) where they did indeed intend for there to be forced downtime so that people would be social, talk, have a break etc. It is very interesting and is completely different to what we experience in current WoW and most other MMORPGs out there. I love the downtime, the social aspects - it's what sets classic WoW apart from a lot of other games. It is very interesting and is completely different to what we experience in current WoW and most other MMORPGs out there. I love the downtime, the social aspects - it's what sets classic WoW apart from a lot of other games. Yeah, I never even thought about how we use that downtime to talk to others. Obviously it happens but I never thought of it as a social time, rather than something to add to the RPG aspect. Although I'm sure they may have meant it as both. I'm glad to go back to that time, since now in retail everything is go go go and no slowing down. I think it's nice to slow down and have to take these breaks, not even just to talk, but to also experience these dungeons like how they were designed to be a challenge. Regardless of whether this is accurate or not, it's certainly resulted this way in practice. When people are having their mana break, and when players are marking targets and discussing strategies, especially during dungeons, they talk. What else is there to do, right? It's great. I still have 2 people on my phone that I met back during early WoW days. Ha, me too. Still have those contacts of my comrades of the past. I'm kind of excited about the opportunity of reunion, although who knows if it's possible. More than ten years have passed after all. Suddenly, the feeling of nostalgia became so real.